The 24.9 metre motor yacht, Mig 1 Mig, listed for sale by Mike Newton-Woof at Ventura UK, has been sold with the buyer introduced by Jim Evans at SuperYachtsMonaco. With exterior styling and interior design by Fulvio de Simoni, Mig 1 Mig was built in GRP by Italian yard Pershing and delivered in 2015 as a Pershing 82 model. Accommodation is for eight guests in four cabins. The master suite amidships provides generous space, with the heads and shower area set along the starboard side. It is also flooded with light thanks to large hull windows on both sides. The VIP suite is forward with an en-suite bathroom and there are two twin berth guest cabins - the port one with en-suite access to the guest bathroom. All cabins come with entertainment systems and satellite television screens. A large saloon and dining area has parquet flooring and is decorated in a simple, uncluttered style with ample seating in front of an entertainment system incorporating a pop up Apple television screen with a surround sound stereo system. Forward is a formal dining area and a galley with the latest professional equipment. The main deck has large, comfortable exterior areas for relaxation towards the bow and at the stern. The bow area has a Bimini sun top, and the cockpit an extendable roof providing shade for al fresco dining. 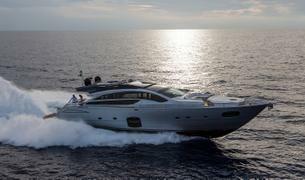 Twin 2,435hp MTU diesel engines deliver a cruising speed of 40 knots topping out at 45 knots. Mig 1Mig was asking €3,700,000.